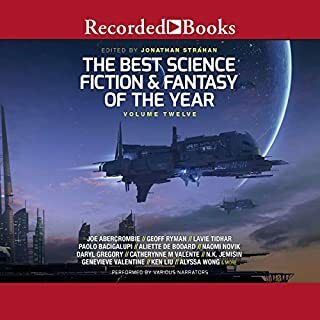 Jonathan Strahan, the award-winning and much lauded editor of many of genre's best known anthologies, is back with his 11th volume in this fascinating series, featuring the best science fiction and fantasy. 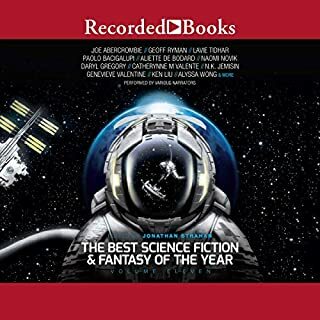 With established names and new talent, this diverse and ground-breaking collection will take the listener to the outer reaches of space and the inner realms of humanity with stories of fantastical worlds and worlds that may still come to pass. A walk around the block, a quick drive, before shutting down your PC ? these short story collections are perfect for when you only have a few minutes to listen." The best of the year's science fiction and fantasy stories as selected by the multiple award-winning editor Jonathan Strahan. Distant worlds, time travel, epic adventure, unseen wonders, and much more! The best, most original and brightest science fiction and fantasy stories from around the globe from the past 12 months are brought together in one collection by multiple award winning editor Jonathan Strahan. Lightspeed is the critically acclaimed, online science fiction magazine edited by best-selling anthologist John Joseph Adams. Each month at lightspeedmagazine.com, top authors and brilliant new voices alike span the genre’s full spectrum, from near-future sociological science fiction, to star-spanning hard science fiction, and everything in between. 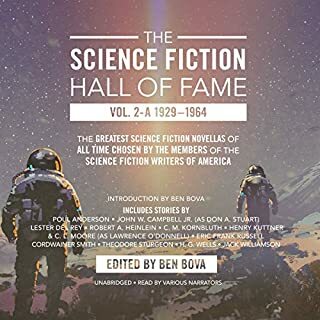 This audiobook contains all the podcasts from Lightspeed's first Hugo-nominated year, performed by a host of star narrators. To keep up to date with the most buzzworthy and cutting-edge science fiction requires sifting through countless magazines, e-zines, websites, blogs, original anthologies, single-author collections, and more - a task accomplishable by only the most determined and voracious fans. 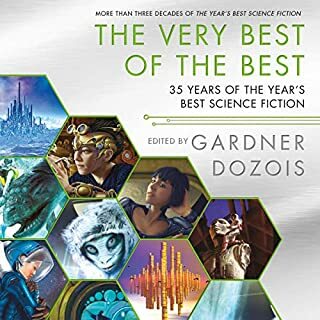 For everyone else, Night Shade Books is proud to introduce the inaugural volume of The Best Science Fiction of the Year, a new yearly anthology compiled by Hugo and World Fantasy award-winning editor Neil Clarke, collecting the finest that the genre has to offer, from the biggest names in the field to the most exciting new writers. The best science fiction scrutinizes our culture and politics, examines the limits of the human condition, and zooms across galaxies at faster-than-light speeds, moving from the very near future to the far-flung worlds of tomorrow in the space of a single sentence. Clarke, publisher and editor in chief of the acclaimed and award-winning magazine Clarkesworld, has selected the short science fiction (and only science fiction) best representing the previous year's writing, showcasing the talent, variety, and awesome "sensawunda" that the genre has to offer. 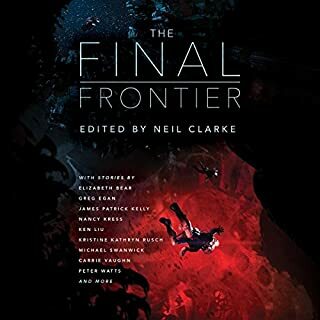 Neil Clarke is the award-winning publisher and editor in chief of Clarkesworld magazine, winner of three Hugo Awards for Best Semiprozine, and the editor of the 2014 cyborg-themed original anthology Upgraded. Clarke lives in Stirling, New Jersey. ©2016 Neil Clarke (P)2016 Audible, Inc.
Would you try another book from Neil Clarke - editor and/or Amy Tallmadge and Jeremy Arthur ? I think not. I know it's a matter of taste, but 90% of these stories were not to my liking. Not enough hard SF. And with all respect to the writers, who work so darned hard, I found their prose weak. The last two stories, however, were excellent, with muscular writing. Who would you have cast as narrator instead of Amy Tallmadge and Jeremy Arthur ? Anyone, I think. Either I know nothing about word pronunciation, or the narrators/producers were lazy in not determining pronunciations before recording . See: arboreal, archipelago, etc. What did you like best about The Best Science Fiction of the Year: Volume One? What did you like least? It's difficult enough to trust Amazon and Audible reviews to be written by actual customers. Now I'm restricted to answering specific pre-package questions. So the question for me is why bother? Maybe you will like this book and maybe you won't. Audible reviews will not help you answer that question. So spend your money and buy this product. That's the business model. What does Amy Tallmadge and Jeremy Arthur bring to the story that you wouldn’t experience if you just read the book? 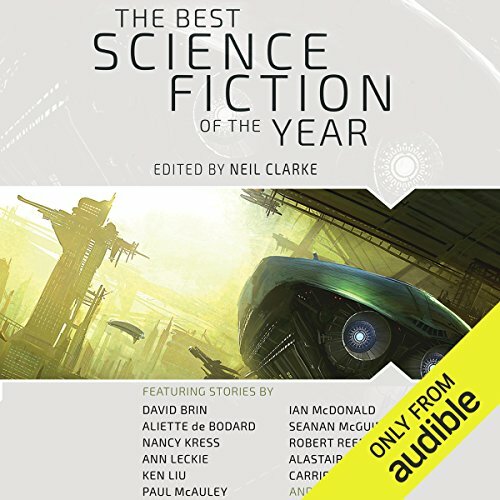 Was The Best Science Fiction of the Year: Volume One worth the listening time? All but the biographies. They did not port gracefully. Maybe this is more the case with science fiction than other writing, but I did notice that the "tell" to "show" ratio was was wildly out of balance. I don't know if it was just the editor's taste that has the anthology loaded so heavily with this brand sometimes frustrating sometimes imaginative unrealized conclusions, or that this style is in court. But I hope it played no part in story selection. What bothers me most about the hanging conclusions in many of these cases is that the authors felt it necessary to drone on about emotional quandaries faced by characters. When, if left unspoken, the reader could be left free to imagine these conflicts given the context. I don't understand why they choose to make such excessive explanations of obvious character dilemmas when they felt no need to fully flesh the finish. It is not that I dislike hanging conclusions, it is just that I don't like hearing/reading them repeatedly and with no clear device to make the conclusion exceptionally suspect. It just seems lazy. My enjoyment was patchy from story to story and narrator to narrator. I found some stories dealing with interesting concepts. To me, who has done some amateur programming, all the stories of software have emotional difficulties are difficult to read. Someone had to program in emotional matrixes and sensory selectivity or just type in the words the software says under whatever sensory load. I am afraid that the smart readers already know that any writer who does the "HAL" thing is hacking the science out of science fiction and giving in to generalized stupidity. A nice mixture of works by a nice mixture of authors. Made me think. Good read. Would have like the book title and author in the chapter listing instead of numbers. I found this collection to be smart, thoughtful, and highly original. This collection sets a very high bar. great short stories. could not follow only two. a great way to spend my car journeys. i wished there were more such books. In the introduction, Meil Clarke mewed on and on about the difficulty in finding paying readers. But he never touches on the obvious reason for the problem. The stories are dull. Page after page of tales from Women Studies Writing Seminars. Crushingly dull soft Sci Fi. I'm struggling to go on after seven or eight of the stories, it starts very strong with two wonderfully crafted stories and it's all downhill from there. 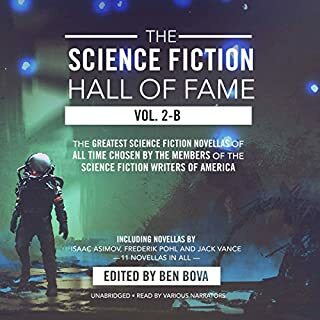 Where does The Best Science Fiction of the Year: Volume One rank among all the audiobooks you’ve listened to so far? Lots of variety and different genres of Sci-Fi. Great for those long walks. Have you listened to any of Amy Tallmadge and Jeremy Arthur ’s other performances? How does this one compare?